April 28 is the 118th day of the year(119th in leap years) in the Gregorian calendar.There are 247 days remaining until the end of the year. Year 224 (CCXXIV) was a leap year starting on Thursday of the Julian calendar. At the time, it was known as the Year of the Consulship of Iulianus and Crispinus. The denomination 224 for this year has been used since the early medieval period, when the Anno Domini calendar era became the prevalent method in Europe for naming years. AD 32 (XXXII) was a leap year starting on Tuesday of the Julian calendar. At the time, it was known as the Year of the Consulship of Ahenobarbus and Camillus. The denomination AD 32 for this year has been used since the early medieval period, when the Anno Domini calendar era became the prevalent method in Europe for naming years. 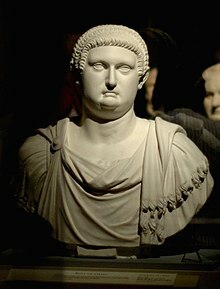 Otho was Roman emperor for three months, from 15 January to 16 April 69 AD. He was the second emperor of the Year of the Four Emperors. Hu Jinsi (胡進思) was a general of the Chinese Five Dynasties and Ten Kingdoms Period state Wuyue, becoming powerful during the reign of its third king Qian Hongzuo. After Qian Hongzuo's death, Hu had frequent conflicts with Qian Hongzuo's brother and successor Qian Hongzong, such that he, fearing that Qian Hongzong would kill him, deposed Qian Hongzong in a coup and replaced him with his brother Qian Hongchu. Saint Vitalis of Milan was an early Christian martyr and saint. SaintGianna Beretta Molla was an Italian Roman Catholic pediatrician. Molla refused both an abortion and a hysterectomy while pregnant with her fourth child despite knowing that continuing the refusal could result in her own death which later occurred. Molla's medical career went in tandem with teachings of the Church which strengthened her resolve to follow her conscience while coming to the aid of others who required assistance. These views came into focus when she decided to save the life of her final child rather than think of herself. Molla also dedicated herself to charitable work amongst older people and was involved in Catholic Action; she also aided the Saint Vincent de Paul group in their outreach to the poor and less fortunate. Saint Louis-Marie Grignion de Montfort was a French Roman Catholic priest and Confessor. He was known in his time as a preacher and was made a missionary apostolic by Pope Clement XI. Saint Peter Chanel, born Pierre Louis Marie Chanel, was a Catholic priest, missionary, and martyr. ↑ Taylor, Helen. "Alice Berry". Australian Dictionary of Biography. Archived from the original on March 5, 2016. ↑ Jackson, Samuel Macauley (1914). New Schaff–Herzog Encyclopedia of Religious Knowledge (3rd ed.). London and New York: Funk and Wagnalls. ↑ Bouchard, Constance Brittain (1987). Sword, Miter, and Cloister:Nobility and Church in Burgundy, 980-1198. Cornell University Press. Wikimedia Commons has media related to April 28 .